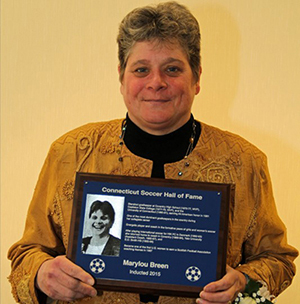 Marylou Breen was a standout goalkeeper at Coventry High School (1973-77, MVP), Castleton State College (1997-79, MVP), and the University of Connecticut (1980-81), earning All American honor in 1981. Breen was one of the most dominant goalkeepers in the country during her collegiate career. She was an energetic player and coach in the formative years of girls and women’s soccer. After playing international soccer for HIK FC in Denmark (1982-83) she returned home to coach in Coventry (1983-84), Yale University (Assistant Coach, 1985-87), and E.O. Smith HS (1995-96). She became one of the first U.S. women to earn a Scottish Football Association coaching license in 1987. Bill Duffy played for the Mansfield Stars, E.O. Smith HS (1980-81), Central CT State University (198286, Captain 85 & 86), and numerous amateur clubs (Hartford Portuguese, New Britain Falcons, Glastonbury Celtic). Duffy won multiple state and Cup titles with all three clubs. He was the editor and publisher of CJSA Newsline and Soccer Connecticut Magazine (1991-2007), VP of the CT State Soccer Association (1992-96), and Publicity Coordinator for the 1991 USA/Norway Women’s International Friendly in New Britain (set attendance record). 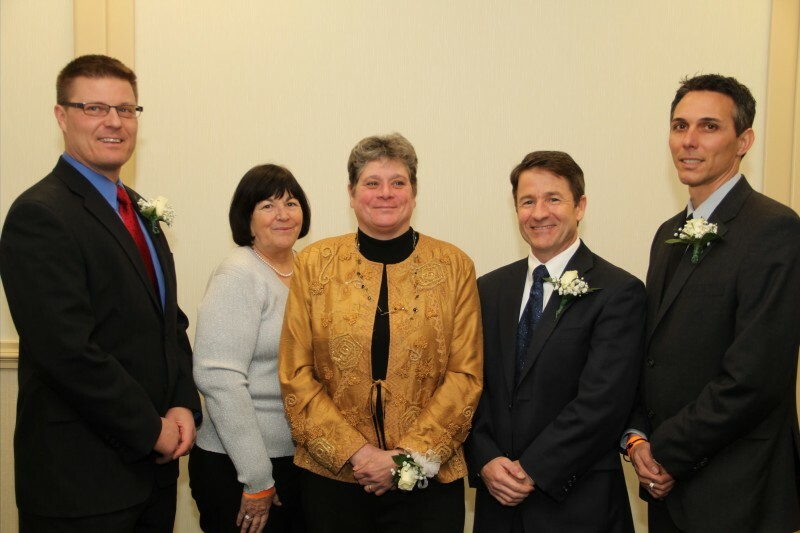 He earned the CCSU Medal of Merit Award (1986, Student-Athlete high GPA), Frederick M. Gladstone Award (1986, CCSU Outstanding Athlete), & CSSA Contributor Award (2002). 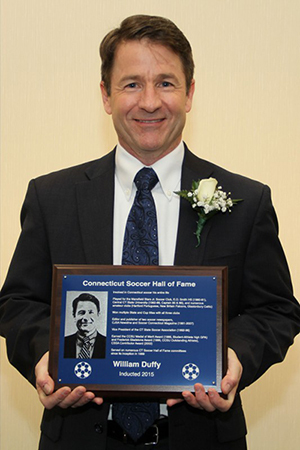 He has served on numerous CT Soccer Hall of Fame committees since its inception in 1999. 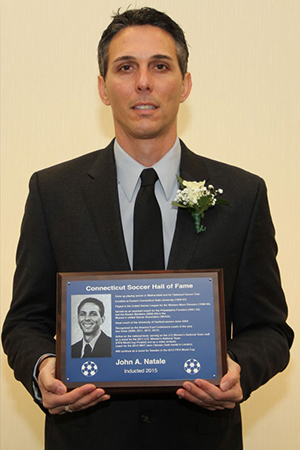 John Natale grew up playing soccer in Wethersfield, CT and for Oakwood Soccer Club. He excelled at Eastern Connecticut State University (199497), and played in the United Soccer League for the Western Mass Pioneers (1998-99). Natale served as an assistant coach for the Boston Breakers (2002-03) and Philadelphia Freedom (2001-02) in the Women’s United Soccer Association (WUSA). He became head coach of the University of Hartford women in 2004. He has been recognized as the America East Conference coach of the year four times (2006, 2011, 2012, 2014). Natale has been active on the national level as well, serving on the Women’s National Team staff as a scout for the 2011 U.S. Women’s National Team and as a video analyst coach for the 2012 WNT (won Olympic Gold medal in London). Natale is currently coaching at the women’s team at the University of Hartford. Gregg Swanson grew up playing soccer in Waterford, CT. He had an outstanding career at Boston University (1979-82, team captain & All New England selection) before returning to Connecticut. He has played on 17 state champion teams as an amateur player in CT and is a LASA League champion and Cup winner. Gregg has served as the President of the Waterford Soccer Club for 25 years, Waterford HS Boys Coach for 10 years, Coach of Southeast Soccer Club & Southeast Premier for 20 years, and has been on the SSC/SE Board of Directors for 10 years. Swanson spearheaded a $400,000 fundraiser to construct a new clubhouse with lights and sprinklers at Spera Field in Waterford. 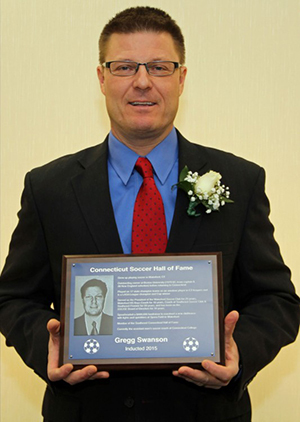 He is a member of the Southeast Connecticut Hall of Fame and is currently the assistant men’s soccer coach at Connecticut College. 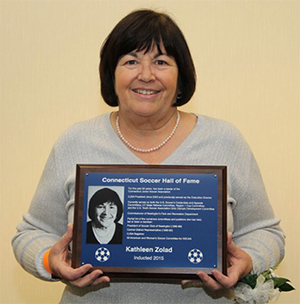 For the past 22 years, Kathy Zolad has been a leader of the Connecticut Junior Soccer Association. She has been CJSA President since 2003 and previously served as the Executive Director. She currently serves on U.S. Soccer’s Credential & Appeals Committee, CT State Referee Committee, Region 1 Cup Committee, and the USYSA Girls Olympic Development Committee. Kathy is also the Commissioner of Newington’s Park and Recreation Department. Her past positions include President of Soccer Club of Newington (1985-89), CJSA Central District Representative (1989-92), CJSA Registrar, and All America Committee and Women’s Soccer Committee for NSCAA. This is a partial list of the numerous committees and positions Kathy Zolad has held, led or been a member. Jim Evans was a captain (1976) & key member of a UConn squad that made three straight NCAA Tournament appearances, reaching the NCAA Quarterfinals in 1974 and 1976. He was an All New England in 1975 and 1976. Evans was a co-founder of the Connecticut Women’s Soccer League and played for Hartford Inca, Hartford Hellenic, Hartford Portuguese, and the Italian-American Stars in the Connecticut Soccer League (1973-1986). Evans was the University of Hartford men’s coach for 12 seasons (1993-04) and accumulated 108 wins, the second most in program history. He made NCAA Tournament appearances in 1995 and 1999 and reached the Elite Eight in 1996. Evans holds the record for most wins in a season at Hartford, with 17 victories in 1996. 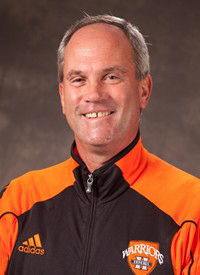 He is the current coach at Hendrix College in Conway, Arizona.